Tallow is rendered fat from beef or lamb bones and/or large pieces of fat. 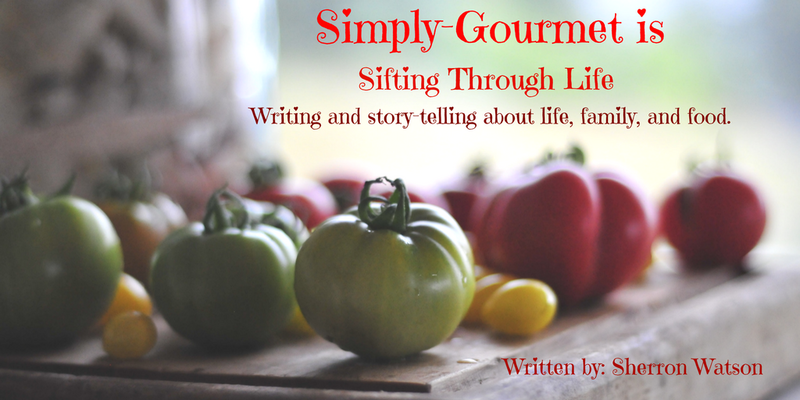 I make my own beef and lamb tallow or pork lard to use in a variety of recipes. Some times I buy extra bones and freeze them just for this recipe. My favorite bones are those with bone marrow. I have also used regular beef bones from my butcher. 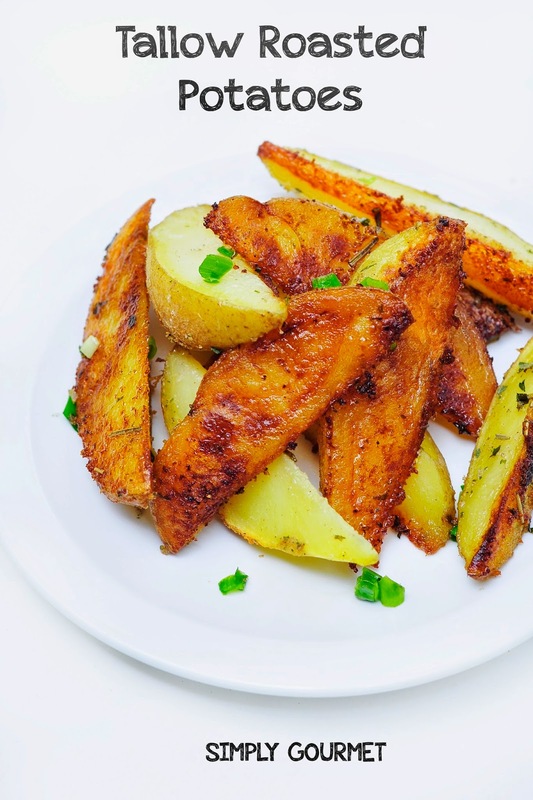 While roasting with the larger bones, the fat "melts" away and roast the potato wedges. You just don't get the added benefit of digging the marrow from the centers of those bones. My daughter and I quickly run to the kitchen to scoop out any marrow that is left in the bones, most of it has melted onto the cookie sheet and is frying the potatoes as they roast in the oven. I add a pinch of salt to the tiny little scoops of deliciousness and savor every bite. Why eat marrow? The benefits are huge especially if you have auto-immune issues as I do. 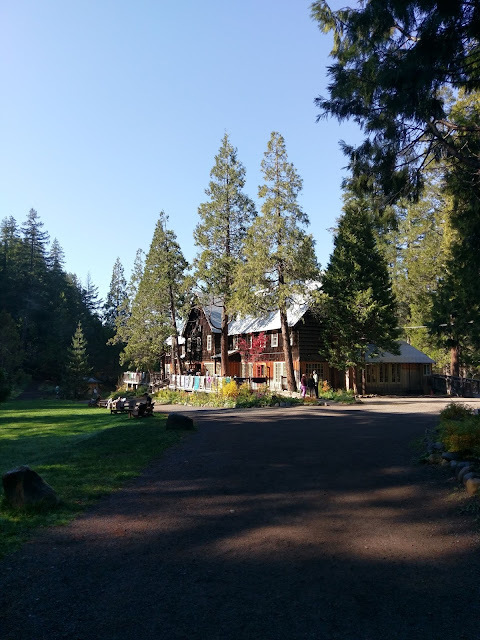 Click on the question and it will take you to a blog that explains the benefits better than I can in this short post. 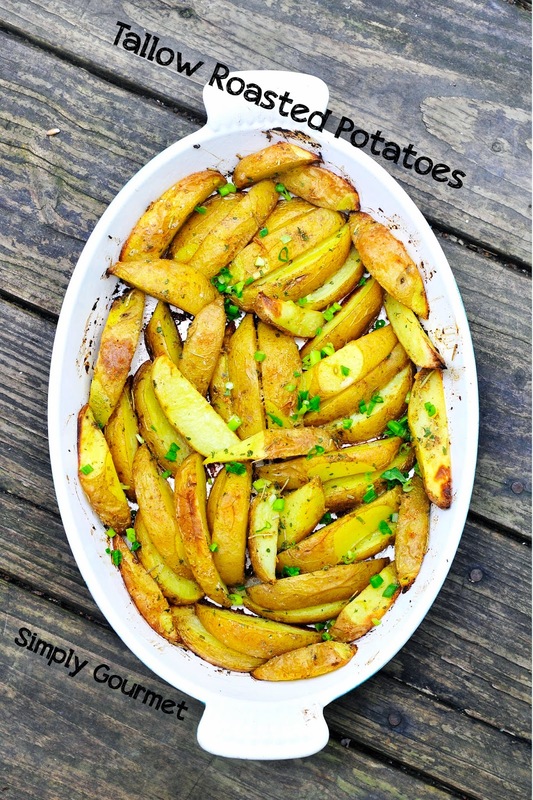 I started roasted potatoes this way a few years ago and they are a family favorite. I roast the bones to make beef stock. By adding the potatoes it seemed that I was saving time, cooking two items at once and using my oven more efficiently. Depending on the type of fat you use, the flavor from that animal, will impart a reflection of the beef or lamb flavor profile. The lard does not have much flavor and will not be as pronounced. The first picture is of potato wedges with lamb tallow. I often buy boneless leg of lamb roast. On this day I cut the roast up to make lamb kabobs. I had a nice piece of lamb fat attached to the roast so I trimmed it and slowly on medium heat, melted it down. I was left with a small amount of tallow. I heat the oven, added the lamb tallow, arranged my potatoes in a 400 degree oven and roasted them until the bottoms were crispy. Each oven is different. My oven took about 40 minutes. These two pictures below are showing you that I have used a huge bone on the left and the smaller marrow bones on the right. I use white potatoes and sweet potatoes. I have also include rutabagas and they turned out great. 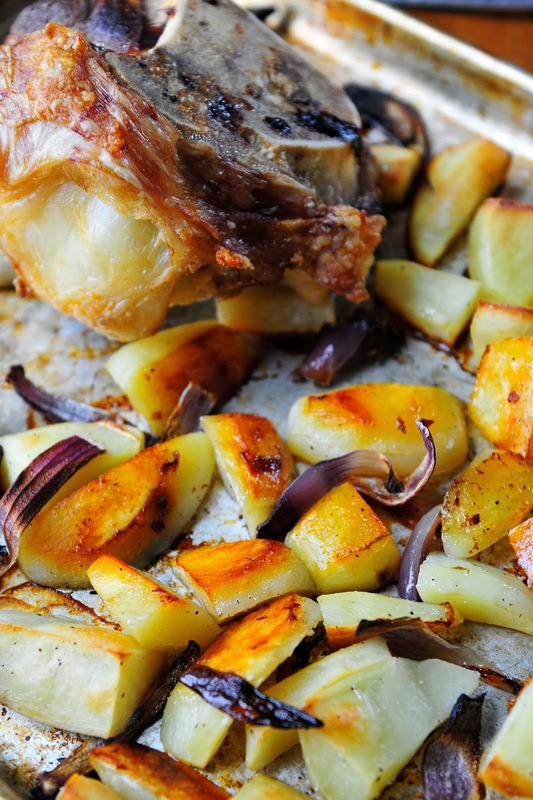 The marrow and the melted fat make the best potatoes, in my opinion. 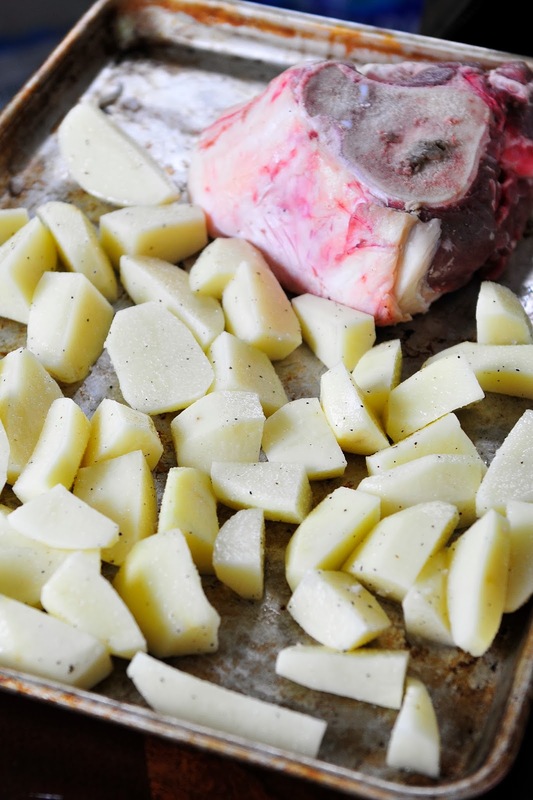 This picture shows that the the large bone will roast and enough fat will melt away that the potatoes are still roasted. I have also included a few onions on this tray. We are not afraid of saturated fat. I don't believe it is something to fear in our diets. In fact, we invite it into our diets. My husband and I both recently had our blood work done and found that our cholesterol is perfect. I believe our diet choices are reflected in our recent yearly examine and our doctors are impressed with our weigh loss and healthy habits. What we did cut out was processed food, refined sugar and most, if not all, junk foods and sugary drinks. Our focus has changed to healthy fats from grass fed animals, more vegetables and fruits, nuts, nut flours and lots of exercise. I encourage everyone to do their own research, listen to your bodies and the advice of your doctors. I can only share with you our experience and how this change in our diet has improved OUR health. 2. 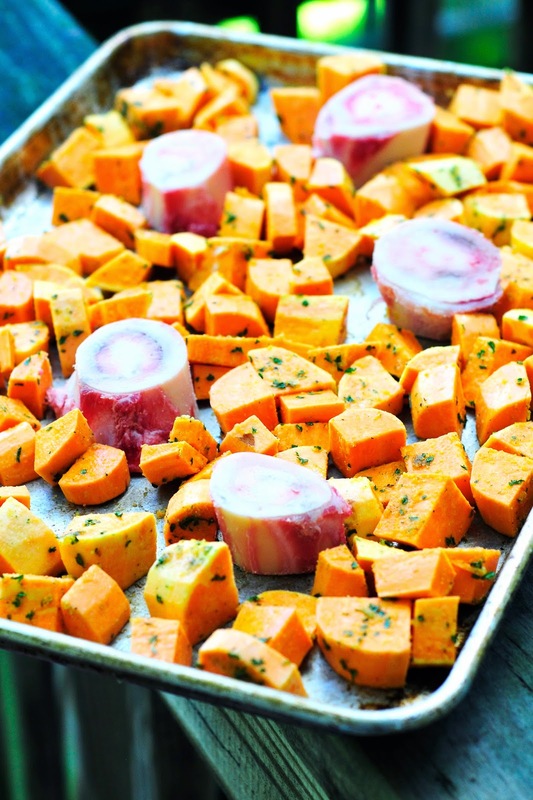 Place bones and potatoes on a large cookie sheet. Season potatoes with a variety of spices and dried herbs. I have listed what I usually use but I do switch it up every once in a while. There are no measurements because use what your family likes. 3. Roast for about 40-50 minutes. The potatoes will be very crispy on the bottom and soft and pillowy on the top. 4. Remove from oven and serve with your favorite dipping sauce. Refrigerate left overs and reheat in the microwave.